The chart below was created to ensure you choose the right Posture Medic for you. Select the Strength (Original or Plus) based on your usual Exercise Program. 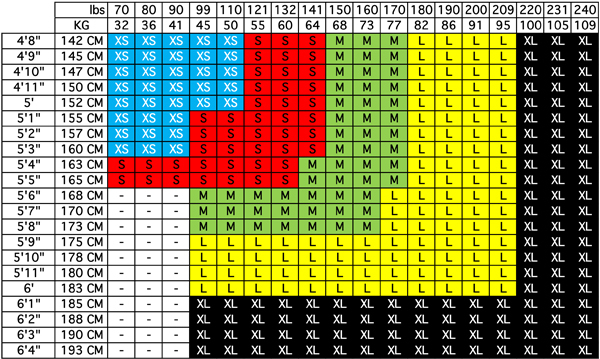 Select the correct size using the chart. 75% of the population should begin with the Original before moving onto the Plus Strength once they get stronger. Those who are considered obese (with a BMI of 30 and over) will require the Plus Strength despite their level of activity in order to support bulk in the chest area. Since I have an hour commute, I like to wear my Posture Medic when I'm on the road. I recommend this product to anyone and everyone who wants to improve their posture or simply have better posture throughout the day. I personally wear mine every day while I'm at the computer taking care of business. What a great product. Posture Medic is the single most valuable fitness resource that I have invested my time, money, or energy into. We have been carrying the Posture Medic for a little over a month now, and have been teaching our members and clients how to strengthen and stretch just as is recommended by the instructional manual. We have seen great results and the women. Copyright 2015. Posture Medic. All rights reserved. Please note this product contains latex. Posture Medic® is not a toy. Keep away from children under the age of 12 years old. Posture Medic® is designed to be used ONLY as detailed per our instruction manual and our website. Use of Posture Medic® in any other way shape or form is the sole liability of the user. Injuries as a result of failure to follow instructions are the sole responsibility of the user. Posture Medic® is not meant or designed to cure, treat, or heal any disease or illness. Information found on our website is provided for information purposes only and is not a substitute for professional medical advice.